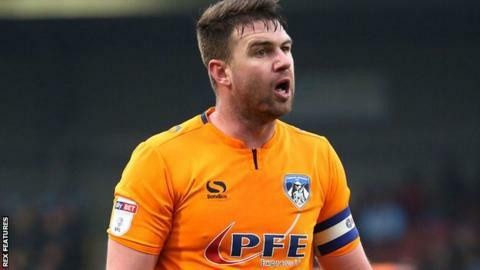 Oldham have criticised the Football Association over their “lenient” punishment of their former player Anthony Gerrard for a “racist joke”. The club says Gerrard posted a message relating to the Islamic holy month of Ramadan in a players’ WhatsApp group. Gerrard, now at Carlisle, has been given a letter of warning by the FA, warned about his future conduct and must attend an education course. The defender, 32, was sacked by Oldham in August for “gross misconduct”. The Latics said they were “disappointed with the FA’s lenient punishment of the racist behaviour displayed”. When contacted by BBC Sport, the FA did not want to comment further, other than to confirm the nature of Gerrard’s punishment. Oldham’s statement added: “Whilst the club welcome football’s governing body dealing with this incident, [it] was a serious matter which we believe has not been dealt with appropriately. “We think questions must be asked about the conclusion of this investigation. Gerrard, who is the cousin of Rangers manager and former Liverpool and England captain Steven Gerrard, moved to fellow League Two club Carlisle after his sacking. He is under contract until January and is in talks about a new deal at Brunton Park. “We’re pleased that it has now been dealt with,” director of football David Holdsworth told Carlisle’s website. Football Focus: Does football have a racism problem? News of Gerrard’s punishment comes after a series of racist incidents in football in recent weeks. Police have interviewed a person under caution following allegations of racist abuse towards Manchester City’s Raheem Sterling during his side’s Premier League loss at Chelsea on 8 December. Chelsea are also under investigation by Uefa after allegations of anti-Semitic chants during last week’s Europa League game at MOL Vidi. And on Tuesday a Tottenham fan was fined and banned from football for four years for throwing a banana skin at Arsenal striker Pierre-Emerick Aubameyang after he scored in the North London derby on 2 December.